All borrowers must present a valid library card (University I.D. or external borrower card) to borrow materials. Library cards are not transferable and will be honoured only when presented by the legitimate card holder, with the exception of the Designated borrower authorization. SFU students (undergraduates and graduates), alumni, faculty and staff may get a University ID card through the Registrar's Office, Burnaby Campus; the Information and Registration Desk, Harbour Centre; or the Student and Registrar Services Office, SFU Surrey. Spouses or partners of faculty/staff, as well as related positions*, and graduate students are eligible for a non-paying external borrower card; obtainable from the Circulation/Loans desk at any SFU Library branch. See External borrower's privileges for more information. The SFU member must provide, either in writing or in person, verification of the applicant’s status. Once confirmed, the spouse or partner will need to complete an External Borrower Application. The application can be obtained at the circulation counters of any of the SFU Library sites. Where the SFU member is long term, in excess of one year, or is considered continuing, the applicant's library card will be issued with an expiry date of 1 year, renewable on request of the spouse/partner. 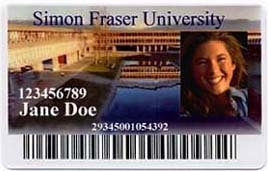 Where the SFU member is on a limited term of less than one year, the applicant's library card will be issued with an expiry date concurrent with the expiry date of the SFU member. The SFU member may discontinue authorization of the card by request to circulation staff; cards will not be cancelled midterm, however, records will be marked ‘do not renew’. The spouse or partner is responsible for any circulation activity occurring on the card including payment for all library material that may be lost while charged to the card. *Faculty/staff related positions include: Research Associates, Research Fellowships, Post Doctoral Fellowships, Faculty Associates, Associate Members, Adjunct Professors, Clinical Associates, Visiting Faculty/Scholars, Sessional Instructors/Lecturers, Teaching Assistants, Tutor Markers, Librarians, Non-credit Instructors, and Archivists. The designated borrower may use the card to pick up holds or borrow library material with the exception of laptops or media equipment. The designated borrower must present the library card plus a piece of their own picture ID when picking up holds or borrowing library material. The SFU cardholder is responsible for any use the designated borrower makes of the card and any overdue items, late charges, damage or loss of library material. The authorization is valid until the expiry date of the card or until the cardholder informs the library of a change or termination of the authorization by contacting libcirc@sfu.ca. Faculty members can arrange for a research assistant to borrow materials on their behalf. To request this service, fill out the Faculty Research Assistant card application, and return it to the loans counter. This privilege may be renewed on a semester-by-semester basis. The loan periods and access privileges, whether for circulating materials or for access to electronic resources (databases, electronic journals,etc.) varies according to the status of the borrower. *Special Loans include maps, journals, rare books, Fraser Library media equipment, Fraser Library games, etc., which are subject to special loan periods and requirements, as authorized by the area responsible for the material. ~ Some exceptions apply. Alumni and External Borrowers may borrow maps and journals. For Alumni off-campus access to electronic resources see Alumni services for details. SFU students are entitled to library privileges during semesters in which they are registered. SFU students with department authorized deferrals may obtain an extension to their library privileges by showing proof of deferral to Library staff at the circulation desk(s). SFU Undergraduate students who are taking one semester off may request staff at the circulation desk(s) to update their record to Semester off status in which case their privileges are restored to the applicable undergraduate level, with one exception: no access to I.L.L. services. These privileges are valid for only one (1) semester and may not be repeated. Unable to come to campus? Please make arrangements with staff by emailing libcirc@sfu.ca or phoning 778.782.4345. Honour students have their loan privileges expanded to equal that of graduate students. This upgraded status is awarded to all undergraduate students in the honours program. Attention graduating students: All SFU alumni are eligible for SFU Library borrowing privileges. You do not get a different library/university card when you graduate, therefore hold onto your card. Your student library privileges will expire two weeks into the next semester. Your alumni library privileges will come into effect when Senate awards your degree/diploma, if you need library privileges in the interim, please talk to staff at the circulation desk or email loans-mgmt@sfu.ca. All SFU alumni are entitled to SFU Library borrowing privileges on presentation of their SFU University ID card. If you no longer have your University ID card you may purchase a replacement from the Registrar's Office at any campus. To use the library, simply present your University ID at the circulation desk(s). You need to advise the Alumni Relations Office of any address changes. Access most databases from within the Library buildings. Access databases remotely (with exceptions: see Alumni services). Some associated categories may obtain a University produced I.D. card which may qualify them for other campus services. Optionally, these categories may apply direct to the library (see circulation desk staff) for an External Borrower card; cards issued by the library are acceptable only for library services. Non-credit students are entitled to a library card at no charge for the duration of the non-credit course in which they are registered. To apply for a library card, come to the library in-person with proof of non-credit course registration. May use research assistance and materials at all libraries. May borrow circulating material at all libraries, under the same loan periods as undergraduates, with the exception of specialized collections such as media collection material. May request books that are out on loan to other users. May Request items, with the exception of specialized collections such as media collection material, be transferred from Belzberg to WAC Bennett or Fraser and vice versa. May request up to three journal article photocopies per day to be transferred from the WAC Bennett Library to the Belzberg Library or Fraser Library or vice versa. Articles will be provided at a cost of $3.00 each. May access library databases either in the library or by remote access for the duration of the course, and access to any items on reserve for the course. External borrower cards can be obtained or purchased at the circulation desk of the WAC Bennett Library, the Belzberg Library or the Fraser Library. All borrowing is subject to the Loans Policy and fines. External organization cards can be obtained by printing the Application form, filling it in and submitting it to Loans Management. †Note UniverCity Residents must physically live in UniverCity neighbourhood beside Burnaby SFU campus. They cannot just be a non-resident property owner, a retailer or employee at UniverCity. Special Audit - borrowing privileges may be expanded to include semester loan periods, remote database and reserve access. **Does not include students from Educational Institutions (private or public). Use research assistance and materials at all three libraries. Borrow general circulating material at all libraries. Request books that are out on loan to other users. Request items, with the exception of specialized collections such as media collection material, be transferred from one campus to another. Request up to three journal article photocopies per day to be transferred Belzberg Library to WAC Bennett Library or Fraser Library and vice versa (articles will be provided at a cost of $3.00 each). Access most licensed electronic resources (databases, electronic journals,etc.) from within the Library buildings. Use multimedia equipment and games held by the Fraser Library, which are only accessible to SFU Surrey students. Borrow 16 mm films, videos or dvds from the SFU Library. Use Interlibrary Loan or Document Delivery services. Access licensed electronic resources from outside the Library. SFU undergraduate students, graduate students, faculty and staff, in good standing, are entitled to reciprocal borrowing privileges at participating Canadian Universities and/or Colleges. In some cases, you will need to get a COPPUL (Council Of Prairie and Pacific University Libraries) card issued by SFU Library to present at the library you wish to use. For additional information on these programs, or to obtain a COPPUL card, ask at the SFU Library Circulation desk(s), or contact Telebook if you are a Distance Education student. Note: Borrowing privileges at other universities and colleges are subject to the policies and regulations of the other university or college and may be more restrictive than what you experience as a member of the SFU community. CURBA (Canadian University Reciprocal Borrowing Agreement). BC colleges: Reciprocal Borrowing page of CPSLD (Council of Post Secondary Library Directors). When there is one or more requests on an item when it is checked out, the loan period on that item is reduced to 1 week. See the Reserves guide for loan periods for the Reserves collection. All circulating general collection books may be requested ie. recalled or hold placed, by other patrons. You are encouraged to place a request as this will reduce the loan period in the cases of semester loans or multiple holds. The book will be flagged so that you are next in line. We may also purchase extra copies of the book if the demand justifies it. Borrowers receive an email with the date-due time at the time of checkout. You may also check the due date of materials, recalls, or status of Requests via the My Library record link on the SFU Library homepage. All patrons will receive notices by email. Journals may be circulated as special loans. To inquire about a special loan of a journal issue, contact Library staff at the Circulation desk where the journal is situated, at either WAC Bennett, Fraser, or Belzberg Library. If a journal is held at another SFU Library, you may request a copy of the desired article be delivered to your campus. The Reserves collection contains research materials identified by instructors for specific courses. These materials have short loan periods (2 hours to 7 days) to allow greater access to these materials for all students in the course. Reserve materials can be found by course number or by instructor's name. For details, see the guide to the SFU Library Reserves collection. You may see multimedia resources listed in the Library catalogue that are available only to SFU Surrey campus users. This is due to the limited number of these resources. It is necessary for SFU Surrey students and faculty to have priority access to these materials for their specific courses. These may not be borrowed or requested by other SFU Library users. If you want to extend the borrowing period for an item, and there are no requests for the item, you may renew it. To maximize access to the collection, please only renew the material you still require and return the rest to allow other users and borrowers to borrow them. General and most media collection materials may be renewed via the Library catalogue, but not special loans, games or equipment. Items must be renewed before the due date. Items that are not returned or renewed will eventually generate a replacement fee. Reserve items may be renewed if there is no hold on the item. At the present time Reserve Renewals are controlled by Maximum Renewal periods. For 2HR and 4HR Reserves the item may be renewed up until 24 hours after the item was originally signed out. For 24HR Reserves the Maximum Renewal period is 72 hours. For 3Day Reserves the Maximum Renewal period is 9 days and for 7Day Reserves the Maximum Renewal period is 21 days. These renewals may be done on-line, in person, or by phoning Reserves at the library where the item was originally checked out, 778.782.4345 (WAC Bennett)/778.782.5050 (Belzberg)/778.782.7411(Fraser). All subsequent renewals must be done in-person at the Reserves service desk where the item was originally checked out. Log into the Catalogue. All of the items that are currently checked out to you will be displayed. Then select individual titles or "Renew all" to renew and see the new due dates. Contact Circulation/Loans desk: 778.782.4345 (WAC Bennett), 778.782.5050 (Belzberg) or 778.782.7411 (Fraser). If the item you want is not on the shelf and is not checked out, inform the staff at the circulation desk(s). Staff will begin a systematic search for the item and will place a Request in your name. If the item is not found within the SFU Library, you may request a copy through Interlibrary Loans/Document Delivery Services. Books can be put on hold or requested by signing into the Catalogue, finding the record for the item you seek, and using the "Request item" option. If a book is on loan to another borrower, that borrower will have 3 weeks to return the item. If the book is located in another branch, it will be brought to the requested location. See the section below on Intercampus Delivery. Typically it will arrive in 2-3 business days. If the book is in the same location as the desired pickup location, the book will be brought to the Hold shelf. This takes 1-2 business days. When the requested book arrives, it will be kept for you for 7 days (3 days for media) on the Hold shelf. You will receive an email alerting you when the book is available. Books you have checked out can be requested by other patrons. If you no longer wish an item on which you placed a hold you can cancel the hold by signing into your online library record and then going to the request section, finding the request and then canceling it. Library materials, with the exception of Reserves, Reference and other special materials, may be transferred from the WAC Bennett to Belzberg or Fraser libraries and vice-versa. To initiate the transfer, search for the item in the Library catalogue, click on the request button, and fill in the form. Generally, the item will arrive in 2-3 working days. Transferred items may be picked up at the circulation desk of the library chosen as the pick-up location. There is no charge to SFU students, faculty, and staff for this service. WAC Bennett Library (Burnaby): to the book return outside the third/main floor, or to the library book return bin located in the Library Receiving Parking Lot (L) (24 hours a day, 7 days a week). During open hours, books can also be returned to the counter staff. Fraser Library (Surrey): SFU students, staff, and faculty can access the Fraser Library book return 24 hours per day, 7 days per week, but will need an SFU ID card to enter the campus after 10 p.m. Other borrowers (not current student/faculty/staff) can access the book return 7 days a week, 7:30 a.m. to 10 p.m.The library and book return is located on Podium 3 of the SFU Surrey Campus. Please do not deposit equipment or special loans into book return. Media equipment (e.g. cameras, laptops, etc.) must be returned to the same library it was borrowed from. On items from the General Collection, fines and suspension of borrowing privileges are only applied to overdue recalled items. There are no fines for overdue material from the General Collection that has not been recalled for another patron. This policy does not apply to fines accrued before May 2018. Fines are applied to overdue materials from other collections, such as Equipment, Reserves, Media, etc. Fines for these items start as soon as the item is overdue, whether or not a hold has been placed. Once the item(s) have been returned, a suspension will remain for as long as the outstanding fines exceed $10.00. Unpaid fines in excess of $50 will result in patrons being blocked from registering for courses or receiving parchments or transcripts. Equipment and keys borrowed from the WAC Bennett Circulation desk are due one hour before closing time. After the maximum fine has been reached, a $20.00 processing charge ($100.00 for laptops/projectors) will be assessed (refundable only if the item is returned before the due date), plus the estimated replacement cost of the item. Penalties may be appealed. Disagreement with the terms of the SFU Library Loans Policy will not be considered as the basis for an appeal. An automatic non-refundable $20.00 processing fee, as well as repair or replacement costs, will be assessed on items that are returned wet, mutilated or broken. A book declared Lost will be charged the replacement cost of the item as well as a $20.00 processing charge (refundable only if the item is found before re-ordered). Appeals regarding penalties and fines should be directed to the Access Services Division. You may submit your appeal in person at the circulation desk at Belzberg, WAC Bennett, or SFU Surrey Libraries; in writing to Access Services Division, W.A.C. Bennett Library, SFU, Burnaby BC, V5A 1S6; or on line by clicking here: appeal form. While an appeal is being considered, renewals and hold requests will continue to operate as normal. Please note that appeals will not cancel or prevent processing charges on lost or long overdue materials. Note: Online appeals are typically considered Monday to Friday 9 a.m. to 3 p.m. Users that submit appeals outside of working hours (late afternoons, holidays, weekends, etc.) will have their fines suspended during the ensuing working days. Date of submission is taken into account as part of the appeals procedures. Decisions made by the Access Services Division may be appealed to the Senate Library Penalties Appeal Committee, whose decision shall be final. Type: Standing Committee reporting to Senate Library Committee. Purpose: To consider cases wherein an individual feels unjustly penalized for an infraction of the Library Loan Policy and to make the final decisions. Procedure: Any individual who is aggrieved by the decision of the Access Services Division of the Library concerning penalties may petition, in writing, to the Head of the Division that the case be considered by the Library Penalties Appeal Committee. The individual or his/her designated representative will be notified by letter/telephone of the date of the meeting and may speak to the Committee on the grievance. The Access Services Division will provide documentation for the Library and the individual or his/her designated representative may contest the evidence or enter any circumstance that may be germane. The decision of the Committee is final. Penalties imposed will be suspended while an appeal is waiting to be heard by the Committee. The fines which have been paid and which are subsequently deemed unfair by the Committee will be refunded. Lost books and attendant charges (replacement costs, processing fees, overdue fines). Late return fees (includes Special Loan, Recall and Reserve overdues). The highest numbers of appeals heard by the Committee dealt with lost books and the attendant charges. In cases of lost book charges, the borrower has been held responsible for all use made of the card, including the replacement charges for lost books and any outstanding fines. In cases of overdue book charges, the borrower has been responsible for returning materials by the due date. Details are provided in the SFU Library Loan Policy (copies also available at the Circulation desk). Borrowers receive an email with the date-due time at the time of checkout. You may also check the due date of materials, recalls, and status of requests via the My Library record link on the SFU Library homepage. All library notices are sent by email. For students and faculty/staff, the library uses your official @sfu.ca email address; for alumni, the library uses the email address on file with the SFU Alumni Relations Office. For all other borrowers, library notices will be sent to the email address you have registered with the SFU Library.